The flowers are yellow with brilliant red throat often not opening fully, and in some plants the red pigment extends like a "mid-stripe" on the tepals. Origin and Habitat: The species occurs in West Texas (El Paso Co. E through Hudspeth, Culberson, and Reeves counties, NE Brewster Co. E of Alpine and adjacent Pecos Co.) New Mexico, Arizona and Mexico (NE Chihuahua, NE Sonora, Coahuila, and Durango). The species is abundant throughout its range. It can also be found as an ornamental plant outside of its native range. Altitude range: 1000-1600 metres above sea level. Habitat: Opuntia macrocentra grows on various soil types in xerophyllous scrub and desert grasslands prevalently in the sandy lowlands, but also in the mountains and intermediate rocky slopes and along arroyos. 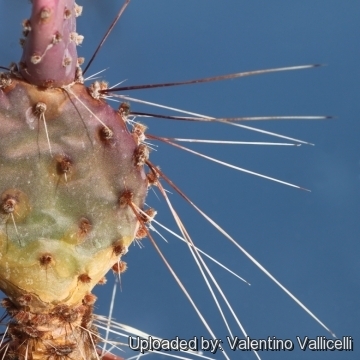 A potential threat to species of the genus Opuntia is the invasion of the cactus moth Cactoblastis cactorum, which can exterminate populations completely. Description: The Purple Prickly Pear (Opuntia macrocentra) is a ground-hugging to nearly upright branched shrubs 60-120 cm tall, up to 3 m wide, usually 4-10 joints high; rarely with distinct trunks. 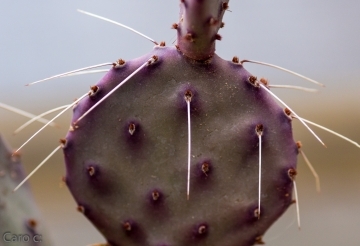 The red-tinged succulent pads and very long spines (macrocentra means long spine) easily distinguish it from the many other species of prickly pear. The purple tinge is greatest around the areoles and on the edges, although the entire plant may be purple in winter. Stem segments (Cladodes): Flat, orbicular to oblong or obovate, often wider than long, 10-20 cm broad, smooth, dark green to glaucous blue-green turning a maroon purple during the winter. The purple tinge is due to betalain pigment (presumably one particular compound, betacyanin) most evident when the plants are stressed by cold or drought. Areoles: 2-2,5 cm apart, arranged in diagonal rows on the midstem segment, with abundant tan to reddish brown glochids, and a pile of gray to tan hairs especially in the upper areoles. Spines: Most commonly 1-3(-4), produced in areoles only on the upper margin of the pad, usually 3 to 7 cm long acicular or slightly flattened, straight, projecting often notably directed upward, whit the lowermost ones (occasionally up to 12 or more cm long) dark black to reddish brown, with whitish or yellowish tips. On immature stems there are fewer and shorter spines. Spineless or near spineless forms of Opuntia macrocentra are at least occasional. In some plants the spines may be white for most of their length (see "var. castetteri"), but usually with a black or reddish base. 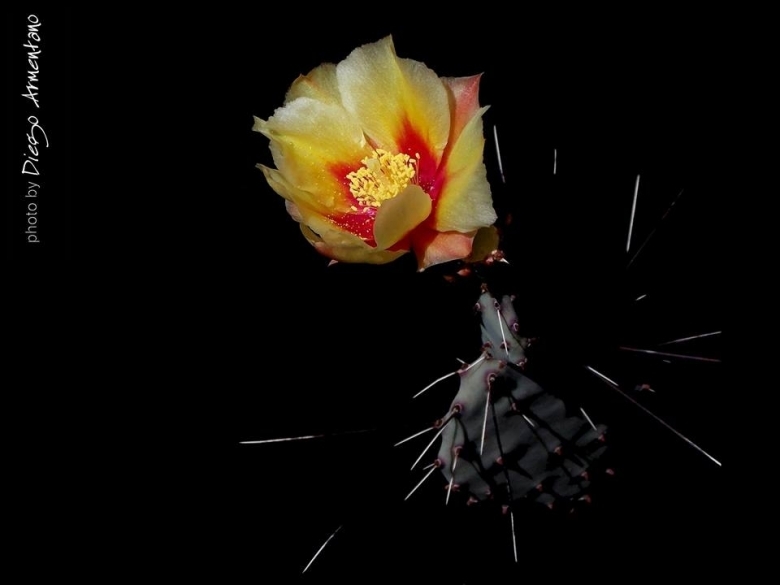 Flowers: 5-10 cm long, 6-7 cm in diameter, yellow with brilliant red throat often not opening fully, and in some plants the red pigment extends like a "mid-stripe" on the tepals (rare in Opuntia). Filaments 15 mm long, pale green and cream-coloured at the tips. Anthers yellow. The Style is 17-20 mm long with about 6 stigma lobes cream-coloured or pale green. Pericarpel 2,5-3 cm long, with few areoles on the upper half with brown glochids. Blooming season: Spring-summer, flowers usually last only one day, opens in the middle of the morning and close at night. Fruits: Ovoid, succulent and juicy at maturity with few areoles, 2,5-4 cm long, purple to pinkish red, edible maturing in summer-autumn. Each fruit has between 12-16 areoles. The umbilicus is deeply concave and the inner pulp and juices are light purple to clear in colour. Seeds: Flattened, tan coloured, 3,5-4,5 mm in diameter, 1,5-1,9 mm thick. Chromosome number: 2n = 22-44 both diploid and tetraploid. 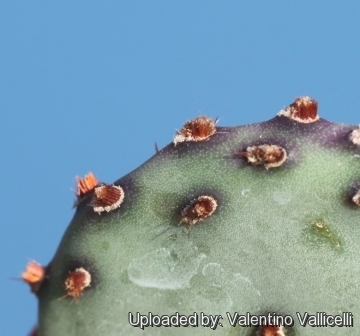 Diploid and tetraploid plants of Opuntia macrocentra are so similar that it not possible to accurately predict ploidy levels from morphology alone. fruits deep purplish red. Distribution: Arizona, Texas, and New Mexico. Opuntia macrocentra var. minor M.S.Anthony: has cladodes 10-15 cm long, glaucous blue-green with few areoles, fruits pinkish red. Distribution: Texas and Mexico. Opuntia violacea Engelm. : has stiff spines on the upper half of the cladode. Opuntia violacea var. gosseliniana (F.A.C.Weber) L.D.Benson: has bristlelike (flexible) spines arising from all areoles on a cladode. 12) Loflin, Brian (2009). “Texas Cacti” Texas A7M University Press. pp. 99. 13) Powell, A. Michhael (2008). 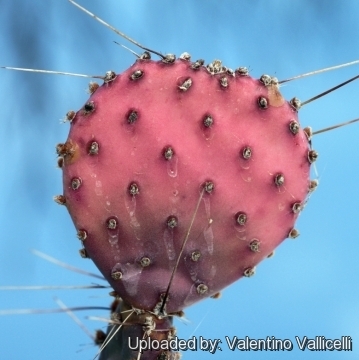 “Cacti of Texas A Field Guide” Texas Tech University Press. pp.144-147. 16) Zimmermann, H.G., M. Pérez-SandyCuen, J. Goluvob, J. Soberón & J. Sarukhán. 2000. 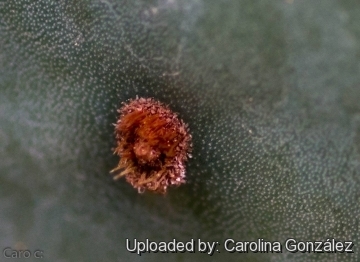 “Cactoblastis cactorum, una nueva plaga de muy alto riesgo para las Opuntias de México”. Biodiversitas 33(1-6). 17) Heil, K., Terry, M., Corral-Díaz, R. & Goettsch, B.K. 2013. Opuntia macrocentra. The IUCN Red List of Threatened Species 2013: e.T152846A685723. http://dx.doi.org/10.2305/IUCN.UK.2013-1.RLTS.T152846A685723.en. Downloaded on 16 March 2016. 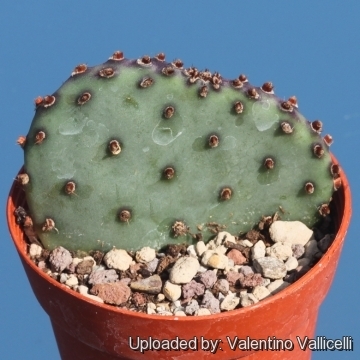 Cultivation and Propagation: This is a a much decorative frost hardy cactus easily found in cultivation. It is a summer grower species that offers no cultivation difficulties. 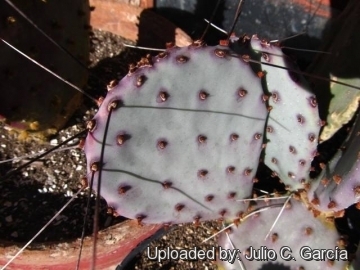 Its purple pads provide a striking accent for an otherwise dormant cactus garden. 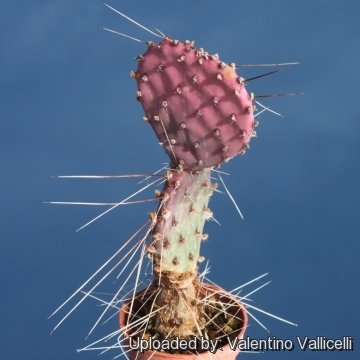 Hardiness: It is a quite frost resistant cactus, hardy to -7° C (- 12° C or less if very dry). However in cultivation it is better not to expose it to temperatures lower than -0° C, even if in an aerated and protected location, in order to avoid the formation of anti-aesthetic spots on the epidermis. In presence of high atmospheric humidity avoid any frost as it is particularly sensitive to root rot. USDA Zone 6-10. It can handle extremely high temperatures in summer.